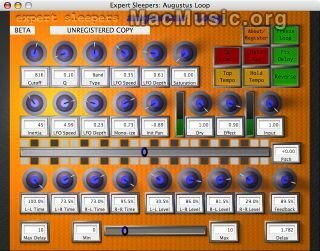 Augustus Loop is a looping device software made by Expertsleepers. it essentially offers a very long delay effect rather than the ability to overdub and undo. The key features of Augustus Loop that make it more than just a big delay effect are: Really long maximum delay (3600 seconds - that's one hour), and Virtual tape : the delay simulates an old-style tape delay, meaning you can change the tape speed (i.e. pitch up and down). Currently in beta, this AudioUnit plug-in is expected to be released some time in June.